My friend Kim asked for a tutorial on binding a quilt, so even though there are plenty of tutorials already out there, I’m adding mine. That’s one of the nice things about having a blog, it makes it easier to explain stuff like this. So here goes! 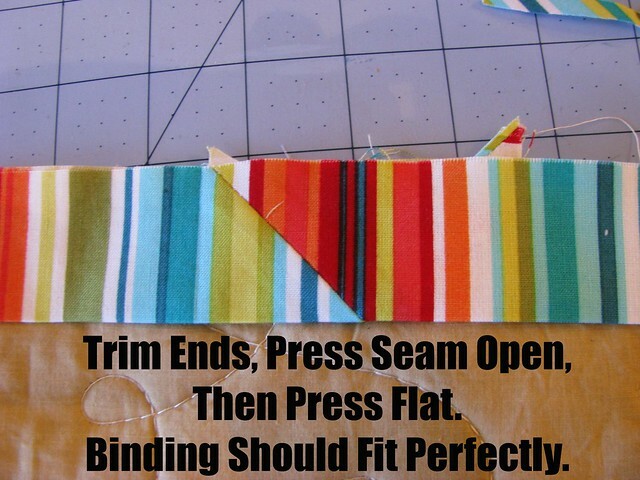 First, choose a binding fabric and cut strips three inches wide across the width of the fabric. (You can measure your quilt if you want to know just how much fabric you’ll need, but as a general rule a half yard is plenty for a baby quilt and a yard of fabric should be enough for up to a twin size quilt.) Then take the first of your three inch wide binding strips and lay one face up to the left, and put another face down on top of it, so the ends meet up across each other as in the photo. (The whole process will be easier if you keep it in your mind that left side faces up from underneath, right side faces down from the top.) Draw a line from the upper left corner of the top strip down to where the lower strip ends at the lower right, making a little triangle shape out of the corner. Sew directly on the line you just drew, backspacing at the start and finish to secure your stitches. Then trim, press the seam open, then fold the binding in half lengthwise and press flat. That’s it! That’s all there is to making binding. 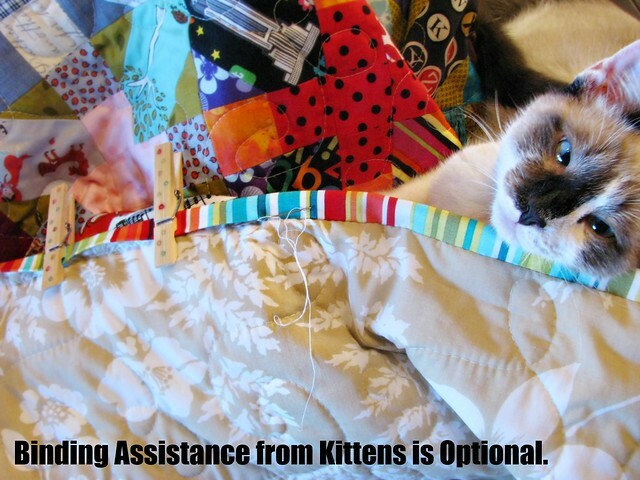 Keep going until you’ve got all the binding you need, then begin pinning it to your quilt. 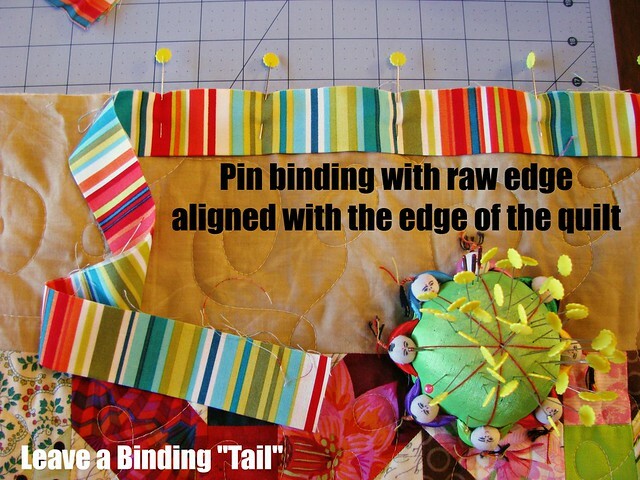 Leave a little “tail” at the beginning, and pin the raw edge of the binding along the raw edge of the quilt. Start in the middle of one side and pin to the corner. Sew clockwise around your quilt. Using a walking foot, stitch with the edge of the walking foot along the edge of the binding and quilt. Be sure to backstitch at the beginning and stop about the width of your seam allowance from the edge of the quilt corner. Backstitch, cut your threads and get ready to pin the next side. Pull the binding up, AWAY from the direction you’ll be stitching, then fold over and begin pinning along the quilt edge again. There will be a little triangle of fabric under the top layer of binding. This is going to make a nice corner on your finished binding. Begin stitching near the corner. Keep going in this way until you reach the side of the quilt where you started. When you get back to the side where you started, go on and sew a bit more of the binding down from the last corner, but backstitch and stop sewing a good distance from the tail you left at the beginning. Leave an ending tail where you stopped. These two ends are going to be sewn together in the same way you connected all the other binding strips, but it’s going to be a little trickier because they’re both connected to the quilt. 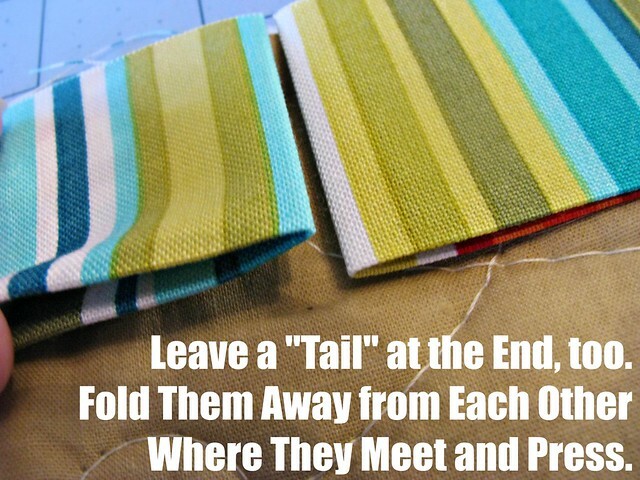 To help you know where to connect the ends, bring the tail ends towards each other until they meet, then fold them away. Use a steamy iron and press where they’ve met so you have fold mark you can see. This is always the funkiest step for me. The “ending tail” is to your left, so open it laying face up, then open the right side binding and lay it face down (without making a rotation, so it will still lay flat), and line up the right side’s edge with fold on the left binding. Make sure the fold mark on the upper right piece is lined up with the top edge of the left binding. Just like before, draw a line from upper left to lower right, and sew along that line. 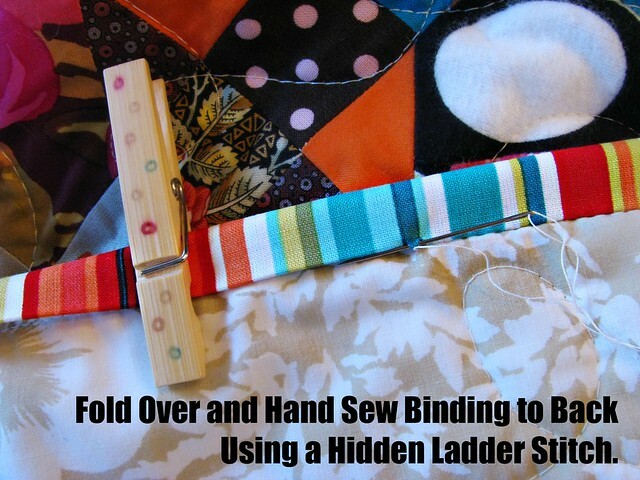 Be sure to pin well, and fold the quilt up a bit so that the binding pieces have the slack they need to stay together properly. After sewing the line, check to be sure the binding “fits”, then just like before, trim the ends, press the seam open, then press the binding flat. 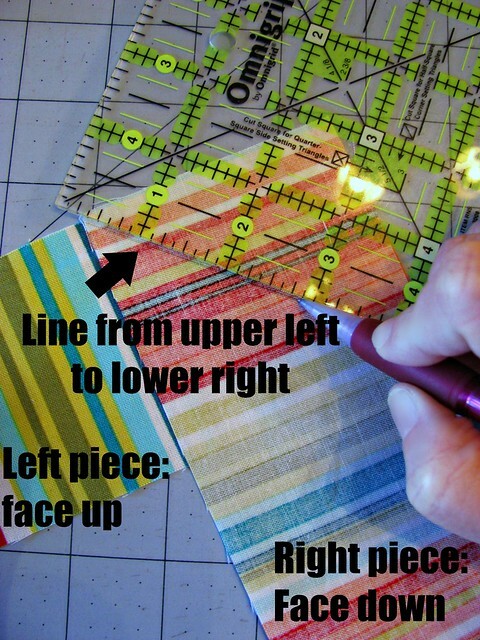 Sew this last little bit of binding down and you’re finished with the machine sewing part of your quilt! Then it’s time to flip the quilt over, fold down the binding and hand sew it down. Pro tip: This is a great time to watch a great series on Netflix. And I can’t resist showing you the truth of how it really goes at my house. It is easier without the kitten. Trust me. Kim, and anyone else, please let me know if any of it isn’t clear, and I’ll tweak it a bit! Could you do a tutorial on how to do the hidden ladder stitch? Hi, and I’m sorry I’m so late responding. I don’t have a tutorial on the ladder stitch, but there are many out there. 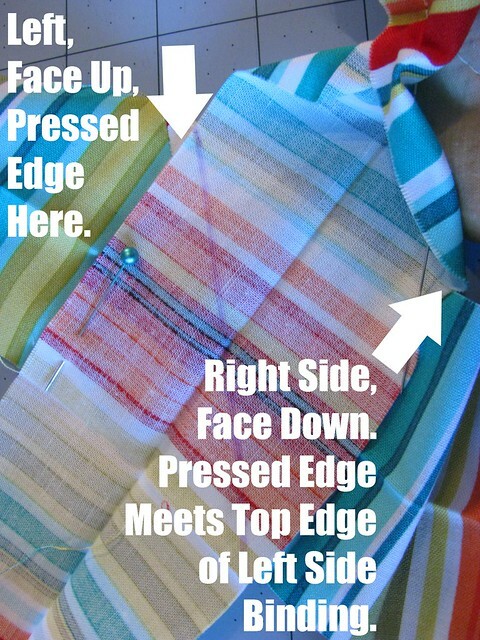 I think this one is easy to follow: http://www.sew-it-love-it.com/ladder-stitch.html I hope this helps!